ARSENAL YARDS 238 • SHOPPING CENTER BUSINESS • May 2017 events, Wilder says. The joint venture be- hind Arsenal Yards is lending design ex- pertise and making a contribution to help the town re-establish parts of the park that are not optimally used — creating new bike trails and building an amphitheater. "Some of our restaurants will back up to the park and the amphitheater. We will activate those areas with outdoor seating," says Wilder, while noting that programming of events at the park will likely be a joint effort between the town and Arsenal Yards. Aside from the park, Arsenal Yards will also optimize outdoor space within its own borders. "We want to blend com- merce with culture, design and recreation to create a broader draw. We are creating a new neighborhood, not just a mixed-use project. 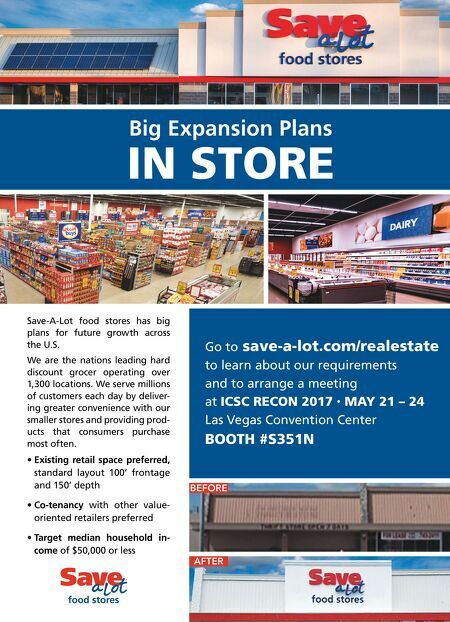 The eclectic mix of retail, restau- rants and recreation is very exciting and will give the project long-term success," Wilder says. LOCATIONAL PERKS Arsenal Yards is located in Watertown. "This market is not dissimilar to Boston, Cambridge or Somerville in its capacity to serve as regional draw. Given its cen- tral location, it has easy access to these very strong markets," Wilder says. 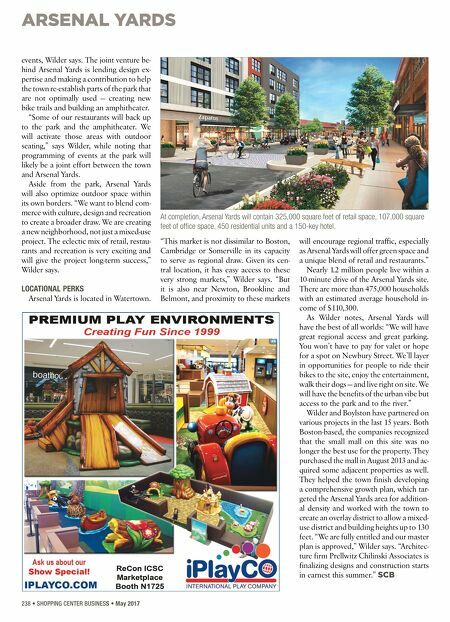 "But it is also near Newton, Brookline and Belmont, and proximity to these markets will encourage regional traffic, especially as Arsenal Yards will offer green space and a unique blend of retail and restaurants." Nearly 1.2 million people live within a 10-minute drive of the Arsenal Yards site. There are more than 475,000 households with an estimated average household in- come of $110,300. As Wilder notes, Arsenal Yards will have the best of all worlds: "We will have great regional access and great parking. You won't have to pay for valet or hope for a spot on Newbury Street. We'll layer in opportunities for people to ride their bikes to the site, enjoy the entertainment, walk their dogs — and live right on site. We will have the benefits of the urban vibe but access to the park and to the river." Wilder and Boylston have partnered on various projects in the last 15 years. Both Boston-based, the companies recognized that the small mall on this site was no longer the best use for the property. They purchased the mall in August 2013 and ac- quired some adjacent properties as well. They helped the town finish developing a comprehensive growth plan, which tar- geted the Arsenal Yards area for addition- al density and worked with the town to create an overlay district to allow a mixed- use district and building heights up to 130 feet. "We are fully entitled and our master plan is approved," Wilder says. "Architec- ture firm Prellwitz Chilinski Associates is finalizing designs and construction starts in earnest this summer." SCB At completion, Arsenal Yards will contain 325,000 square feet of retail space, 107,000 square feet of office space, 450 residential units and a 150-key hotel.